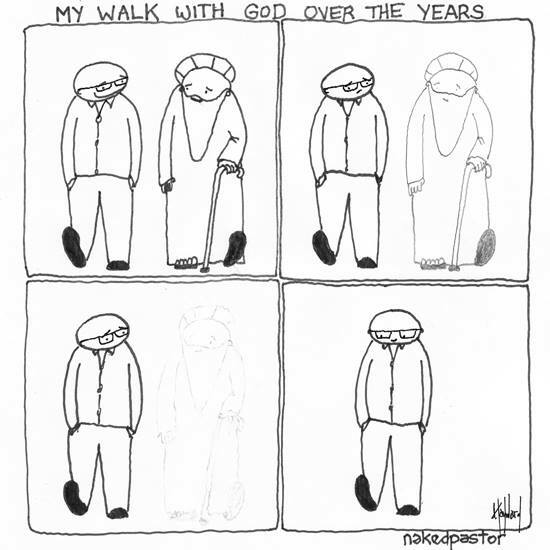 “How God Let Me Go” – a drawing by David Hayward (Naked Pastor), an ordained minister of the Christian faith. What an attention-getting name for a blog, I thought while surfing the ‘Net in 2010. Was this some ketchy (Urban definition is: cool, neat, hip) offering from someone who never tried religion enough to have an informed opinion? Or, could it possibly be a real pastor wanting to make a statement? Challenged and entertained, indeed. But also served. David, it seemed, was this brave man whose openness and honesty was serving a myriad of people who have had some significant and difficult experience with their community of faith. So David expanded his blog to include his creation of an on-line community called The Lasting Supper. How did David’s blog capture me? In the early 2000s, I had begun an administrative role at a parish of my faith. I had accepted the position with gusto and expected it would be a treat to be amongst spiritual people daily. After decades of marching the marbled halls of Corporate Canada and swabbing the messes laid by politicians supposedly running Government, I thought these simple, uncomplicated and loving responsibilities would help grow, groom and hone my spirituality. Phew! How naive and ill-placed those expectations turned out to be. I discovered a spiritual underbelly more cruel than any professional business practice I’d encountered. No teaching contained in Christianity prepared me for the nastiness that broke my heart. David offered an oasis for sorting and shape-shifting that invites healing. David addresses the “unsayable”. He puts a light on the dark, smelly patches that others simply avoid. His message shocks. It exposes soft spots and drains wounds. Just when I think he’s likely emptied his quiver, he shows where his gaze holds another bullseye. He recently posted How God Let Me Go. I KNEW he wouldn’t be saying he’s been abandoned by God even though his cartoon could certainly force the question. As I read through the post, I silently cheered. I was viewing the graceful unfolding of a Mystic. I respect David steadfastly and celebrate yet another level (dimension, depth…???) of his faith. His heart’s been obvious through delivering its spiritual breath to others whose ember needs to be fanned. In the midst of giving up a profession, facing the loss of income, being a homebody while his wife attends Nursing School, maintaining his stature as a go-to-and-is-always-there Dad and keeping a healing message for a throng of people, his service never faltered. He just kept showing more strength. I have no right to interfere, but he keeps taking me back to Mysticism. Thankfully, my spiritual teachers flamed my appreciation for mysticism. They provided me with insights and resources that hold stories of incredible courage exercised by ancients whose mystical and wise lives were full of challenge, torture and tumult. They practiced their beliefs under the threat of death. Their message had to be camouflaged and shared like some modern day dope deal. One such mystic anonymously wrote: The Cloud of the Unknowing. To me, it’s a call to trust. I’ve learned that Love would rather be tested or confronted than discarded. My humanness causes me to test this Love regularly. How would I manage if I was not free to do so without fear of losing my life. I trust that All That is Love doesn’t let go. Ever. So, I’m going to keep my eye on David Hayward. He may not call himself mystical, but, in my view, he’s a modern day mystic who bears watching. Not out of fear…only Love. Off to visit the Naked Pastor! Never, Kim. NEVER. Ever! Thanks be! Hey kid – how are you? I am really depressed. No, I am not looking for sympathy, after all I have allowed this. I must get myself out of it … which brings me to the article. At the end – I love his definition! I would say the exact opposite was true for me. But then of course – it is really the same thing, isn’t it? Thank you for taking me there. I am going to start writing again. Odd thing, I do not have a clue how to open either of my blogs … ah well. Maybe a new blog. Damn depression! It clings worse than velcro. It gobsmacks me when I see friends, whacked at their knees and hardly able to get up in the morning, rise to face the world and meet it day after day. Liz, I’ve been a sporadic blog writer. Does it sound brittle to say that most of everything has been said. Some of it is being said in so many different ways that it can be hard to recognize. I do know that there’s tons of negativity and I don’t feel like perpetuating it. I still meditate regularly and receive incredible guidance. It keeps life clear and fairly simple. If it isn’t, I typically find it’s me screwing things up by talking to myself about the dumbest, most negative stuff. Bringing it back around can be like turning around a locomotive. Above all, I know the energy I put out (as with all of us) is being matched and downloaded accordingly. In so many ways, this is validated for me and it makes me laugh. So with all the help I receive, I am willing to be the one throwing Love Darts. It sure keeps me in good downloads! If you start a new blog, please let me know. Post its link on Face Book, too. You have such rich, poignant and needed insights to share, dear woman! Liz, that link took me to “This Side of the fence” – a blog by someone named Emi.